As you can see, the availability of materials, sizes, styles and colors are unlimited. There is a combination to fulfill the most demanding requirements within budget. Add depth and dimension to your ordinary signs with 3D Lettering. Materials range from foam-backed laminate to solid brass. Give your sign attitude and feel with these beautiful eye catching letters. Intertrade has a wide selection of letter materials, all of the highest quality. We use the finest extruded foam and brand name plastic sheet. 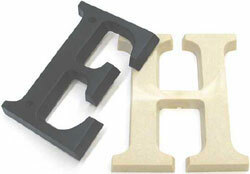 Our interior letters are engineered to mount easily and last indefinitely. Exterior letters are manufactured to stand up to the harshest of weather conditions. All Pricing is based on custom orders. Please contact us for detailed pricing based on your needs.